As a yarn buyer I have to be careful not to allow my likes and dislikes get in the way of our process of yarn selection so that we can have a wide range of fiber and yarns. This becomes difficult when I am shown ribbon like yarns or yarns with a paper/linen like texture. 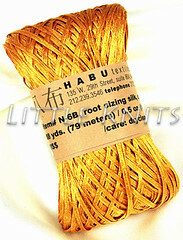 And that was my first reaction to Habu’s Root Sizing Silk, a 100% silk made of multiple strands of silk put together flat/parallel with a vegetable root coating to protect the fiber while being worked. My reaction quickly disappeared when Takako (owner of Habu), showed me a scarf knitted with this yarn, which after its first wash turned into a beautiful silk scarf – exactly like you would expect from silk fiber – with a soft and smooth feel next to skin and a lovely drape. The coating is Konnyaku, a vegetable root, which holds the fibers together and protects the silk fiber giving it a ribbon like look. When we worked with Root Sizing Silk it felt something like working with a paper-linen-ribbon yarn that is somewhat stiff and may be a little crunchy-like. 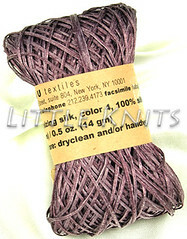 But the real surprise for this yarn comes after it has been – gently – washed in warm water with mild soap. This is when the sizing washes out and the yarn becomes soft, feels great next to skin, and drapes beautifully. 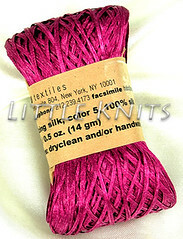 Root Sizing Silk has a beautiful sheen, comes in rich colors with depth, and once washed it morphs into something different and even more so unique and lovely. 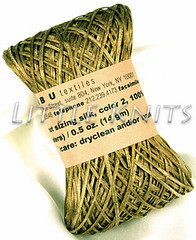 This silk also works perfectly as a warp yarn. We wanted to share Root Sizing Silk with you as part of a series of new yarns we will be listing from Habu within the next week. Hope you are all well and working with your yarn with a smile. LOVE the new blog format!! This is so much easier to read and navigate.